Smart shopping seems to be catching on – people are no longer rushing out to buy the moment the need arises. Reading through this article will help you to become aware of the various factors you need to take into consideration when deciding on a reel lawn mower. The reel lawn mower is quite an interesting piece of machinery. Invented by Edwin Budding in 1830, this mower works in the same way a pair of scissors does. 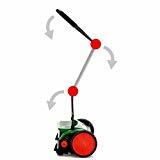 Reel mowers are the most natural way to cut grass provided you buy the manual model. You will also find gasoline and electric powered reel mowers on the market; in this article we focus on the manual reel mower. - Do you like to maintain a grass cutting schedule? For example are you the kind of person who likes to get the lawn mower out every Saturday morning for a quick run over the lawn to tidy things up? - Is your lawn a small compact one? - Does noise pollution affect you greatly? - Do you dislike the smell of gasoline and the fumes that the lawn mower blasts into your face? These mowers are the most natural way of cutting grass and regular use of this mower will give you one of the best kept lawns in your neighborhood. It really is a good experience to mow your lawn in silence, smelling only newly mown grass and enjoying a bit of exercise. - The scissors like action of the blades cuts the grass (a better option for the grass) and the clippings; more like a fine spray are left behind as mulch for the yard. - Environmentally friendly, no pollution emissions because of the absence of exhaust fumes. - Reel mowers don’t work very well on very tall grass – you need to be organized and dedicated to mowing the lawn on a weekly basis to get the best out of your machine. - Small lawns of half acre or smaller are quite suitable for a manual reel mower; bigger lots will require an electric or gas powered mower. - If you live on a half acre lot or smaller, then a manual reel mower is a very reasonable choice. But if you have much more grass than that, then it’s going to be too time consuming for the average person. As enjoyable as it is to use a reel mower, it gets old mowing for three hours. - If you do buy a gasoline powered reel mower you need to get one that is CARB certified if you live in California. Click the link for more information on reel lawn mowers.